You see, Matt is a professional sport shooter who had a very interesting 2004 Olympics. Just prior to the Olympic Team Trials, someone entered the locker room where his rifle was stored and severely damaged the gun in an apparent sabotage attempt. Matt borrowed a former college teammate’s rifle for the trials and went on to win Olympic gold in the prone position using that rifle. Working on a second gold in the Three Positions Competition, he appeared set for victory when he accidentally shot his last bullet at another competitor’s target instead of his own and dropped from first to fourth. After the disappointing mistake, a female shooter he did not know from the Czech Republic named Katerina Kurkova came to console him…that’s Katerina (Emmons now) pictured above, and they were married in 2007. Fast-forward to 2008, and Katerina has just set an Olympic record in the qualification round of the 10-meter Air Rifle competition (surely with Matt watching, as he would later win a silver medal). The final round begins, and as the eight competitors take their 10 shots, gradually Katerina takes a lead and hangs on to the end, winning a gold medal and tying another Olympic record. At first it would seem that Katerina dominated her competitors in Beijing…but did the finals really tell us if she was the best shooter or not? It turns out that the finals alone not only don’t differentiate the medal winners from one another—they don’t even differentiate the gold medal winner from the worst finalist! This is seen in the Plot above and verified by a nonsignificant p-value in a One-Way ANOVA and multiple comparisons. Fortunately the winner is determined by combining the points from the 40 shots taken in the qualifying round with the 10 shots taken in the final round, which should provide for some statistical separation between the shooters. Setting Olympic records in both qualifying and the finals should count for something too! 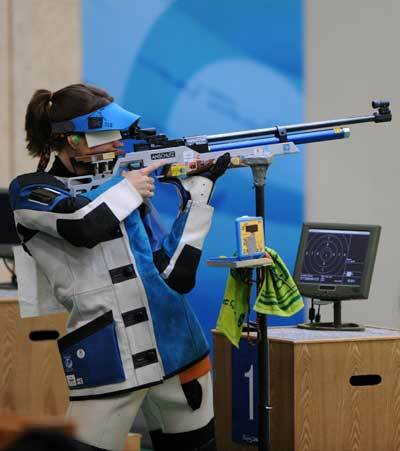 You can watch Katerina compete in the London Olympics in the 10-meter Air Rifle on July 28, 2012. Hard-luck Matt, who has twice dropped from position 1 to 4 in the finals of competition on his last shot, and is recovering from thyroid cancer, will compete in the 50-meter Rifle Three Position on August 6. We wish him success this year!